A great lesson plan briefly explaining the origins of the Notting Hill Carnival. Lesson also includes a video and activities where students concentrate on new vocabulary plus improve listening skills. 1. Ask students whether they’ve ever taken part in a carnival, which carnivals they know and why carnivals are organised. 2. Divide students into pairs or small groups, give out a list of words (Exercise.1 workout). Allow 3 minutes to discuss the words, and another 3 minutes to check the unknown words in the dictionary (only 1 student is allowed to check the meaning on www.dictionary.com using his/her mobile). Elicit the definitions. 3. Tell students that these words are connected to one of carnivals. Ask which carnival it is and why it might be celebrated. 4. The purpose of Exercise.2 is to find out if students’ predictions were correct and to provide more details about the Notting Hill Carnival. The text in Exercise.2 is divided into relatively small chunks. Divide students into small groups and spread out the parts of the text. There should be no more than 5 students in each group so that everyone has a chance to read the part. Students should listen closely to each other as their task is to answer the question to the part that is being read. Student who’s reading the section of the text can’t answer the questions that refer to his/her part. Parts should be read in order 1-5. 5. Ask students their opinion why there are so many people taking part in the carnival. Tell students that they are going to watch a video where few people are going to give their reasons for joining the carnival. 6. Students task is to briefly describe the physical appearance of people how are speaking during the clip. Play the recording once, allow students to compare their answers. Play again and later elicit the answers. 8. Ask students the reasons why some people believe that attending the carnival might be dangerous. Get feedback, possible answers: there are too many people, a lot of thieves, people drink alkohol. 9.Students are going to watch next part of the video about the safety and security during the carnival. While watching their task is to find the connections between words from Exercise 3 and the clip. route- before going to the carnival it’s recommended to check the route in order to avoid delays or to check the best way to get there. 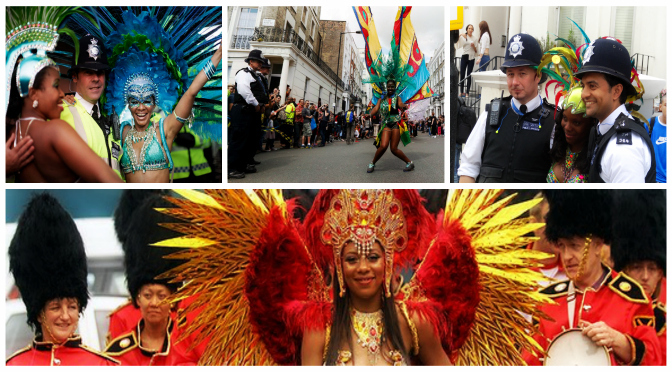 You could ask your students whether they’d like to take part in the Notting Hill Carnival. Why/ Why not?